YANGON—Of Myanmar’s 14 state and regional chief ministers, few have seen such highs and lows in terms of their public approval as Yangon’s U Phyo Min Thein. In 2016, the country’s biggest nationalist group, Ma Ba Tha, threatened to target him with a nationwide protest after he vowed to wipe the group out. In response, Myanmar people at home and abroad turned out to show solidarity with him. In January last year he experienced the kind of surge in popularity his counterparts elsewhere in Myanmar could only dream of when he hastily introduced a new public bus system. Thousands of volunteers manned some 2,000 bus stops across the city for five days to help commuters negotiate the transition to the new system, distributing flyers with new bus route information and helping them install the YBS (Yangon Bus Service) mobile application. Recently, however, his reluctance to cooperate with Parliament and his penchant for expensive, poorly planned development projects—some of them worth billions of kyats—have earned him mounting criticism not only from the public but also from lawmakers in his own party. 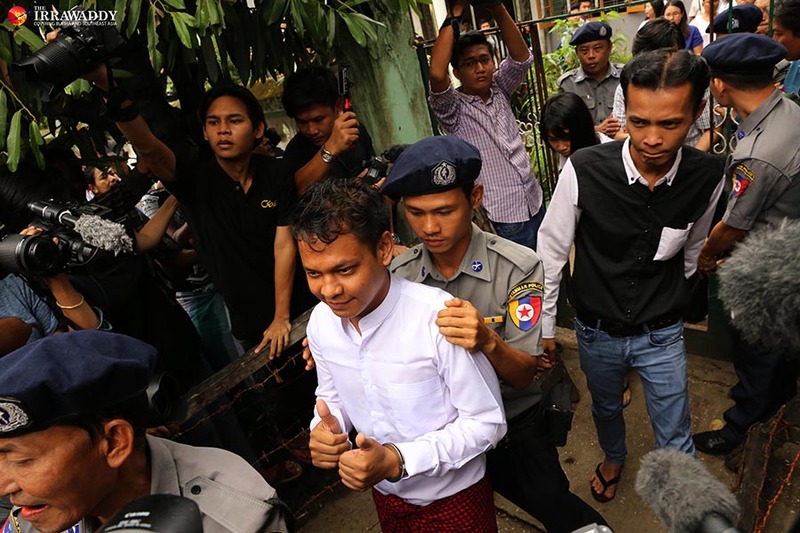 The latest blow to his popularity came last week, when his administration’s lawsuit against three local journalists for publishing “incorrect information” about the Yangon government drew a sharp public backlash. Many viewed the action as a threat to freedom of expression and inappropriately harsh for a democratic government, while others simply saw it as a “distortion of democracy”, as lawmaker Daw Kyi Pya of the ruling National League for Democracy (NLD) put it. U Phyo Min Thein became the chief minister of Yangon in 2016 after the NLD’s victory in the previous year’s general election. After nearly three years in office, his initial popularity is waning. Most people in Yangon would be hard-pressed to name any genuine landmark accomplishments that have emerged from the many initiatives he has introduced, be they difficult tasks like launching the Yangon Bus Service and his resettlement plan for squatters, or seemingly less challenging issues such as opening a night market. “He dreams a lot, but [the dreams] rarely come true,” said U Kyaw Zay Ya, an NLD lawmaker in the Yangon regional parliament. The lawmaker said it would be different if the chief minister consulted with the parliamentary committees established to handle regional development in various sectors. U Kyaw Zay Ya said the committees have submitted their findings and suggestions to the chief minister but have yet to receive any feedback from him. “I doubt if he reads them. We have never been invited for discussions [about the reports],” said U Kyaw Zay Ya, who is the secretary of the parliamentary Finance, Planning and Economic Committee. The Yangon government was recently the subject of a public outcry after the auditor general submitted an explosive report to the regional parliament on the government’s fiscal 2016-17 budget. Lawmakers found irregularities including the government’s arranging of a 13.5-million-kyat loan from two private banks to its own companies without parliament’s approval. More than two dozen lawmakers painstakingly went through the report’s findings in parliament, raising questions such as whether the companies had received presidential permission—a requirement under the Special Company Act for any enterprise receiving capital investment from the government. Not a single government minister agreed to debate the findings in parliament. NLD lawmakers U Nay Phone Latt and Daw Kyi Pya both said U Phyo Min Thein’s government had made little effort to collaborate with parliament over the course of more than two years. “They rarely take our questions seriously. They have dragged their feet on implementing proposals approved by parliament. And they have carried out some development projects without letting parliament know in advance,” U Nay Phone Latt said. Daw Kyi Pya said Yangon has many problems to tackle—including economic issues and the handing over of public land to private companies under secretive deals made by the previous government. The lawmaker said she understood that solving such problems isn’t easy. But she suggested that consulting or collaboration with parliament on the issues could make it easier for the chief minister. “But there has been very, very little collaboration,” she said. On the business front, Yangon’s chief minister has not fared well. In 2016, he drew the ire of the city’s construction sector when he halted construction of more than 200 buildings to check if they had followed construction regulations. The move had serious consequences: labor issues, complaints from buyers of unfinished apartments, delays on repaying bank loans, cash flow problems and a lack of business for construction suppliers. U Kyaw Kyaw Hlaing of the Smart Group of Companies said he had attended several meetings with U Phyo Min Thein. “He rarely pays attention to what other people say,” said the chairman of Smart, a business group specializing in technical services and electronic trading. U Phyo Min Thein’s relationship with the media has deteriorated steadily as well. The lawsuit attracted serious criticism as an inappropriately harsh reaction for a democratic government, as the Eleven Media story was based on lawmakers’ budget discussions in the Yangon parliament. Even the country’s deputy information minister said the move had harmed not only the government, but also the state. The NLD parliamentarian U Nay Phone Latt said the lawsuit was a threat to anyone who pointed out irregularities in the government’s activities, and to freedom of expression in general. “If the story is wrong, the government can respond with a press conference. If the criticism is true, all they have to do is fix the problem. I totally disagree with the lawsuit,” he said. Daw Aye Aye Win, a former Myanmar correspondent for The Associated Press, said the government had acted in an extreme way, opting to suppress the media rather than open a discussion. “The way they responded is negative and disappointing. As a democratic government, they can file a complaint if the story is wrong,” she said. Yangon resident Ko Moe Thway described the chief minister as someone who comes up with good ideas but rarely follows through, citing the Yangon Bus Service, the night market plan and traffic congestion as examples. “He rarely follows through and maintains momentum,” he said. He added that the latest issue involving the lawsuit against journalists over their coverage of the government’s budget could damage the chief minister’s popularity, as even NLD members had criticized him and questioned the lawsuit. “I would like to see him show respect for democracy and human rights while dedicating himself to improving the lives of Yangon residents,” Ko Moe Thway said. Yangon Chief Minister U Phyo Min Thein was not available for comment on Monday.